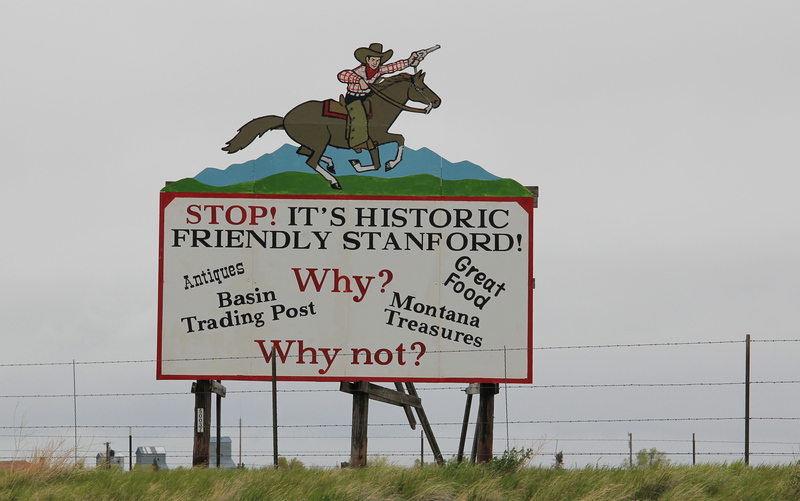 The sign on U.S. Highway 87/Montana 200 says it all: why not stop in Stanford? If you are a railroad town planning fan, it is an absolute. Geographer John Hudson a generation ago talked about the distinctive historical northern plains landscape created by the great transcontinental lines at the turn of the 20th century in his book, Plains Country Towns. His work, then just recently published when I was surveying the state for its preservation plan in 1984, became a conceptual bible of a sorts for me–allowing to see significance where others might just say, ah it is just another dusty western town. Stanford, the seat of Judith Basin County, might appear to be exactly that when I first stopped in 1984. The county had been established in 1920, one of the last during the homesteading boom. 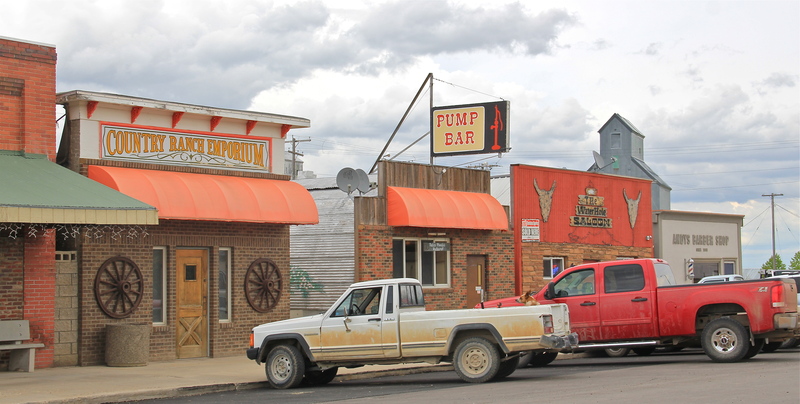 The town’s rhythm of one-story, often false-front stores conveyed little that might be considered special or noteworthy (although the Pump Bar is always worth a stop). The old state bank building and a neighboring retail establishment were the only spaces that conveyed a sense of architectural styling. 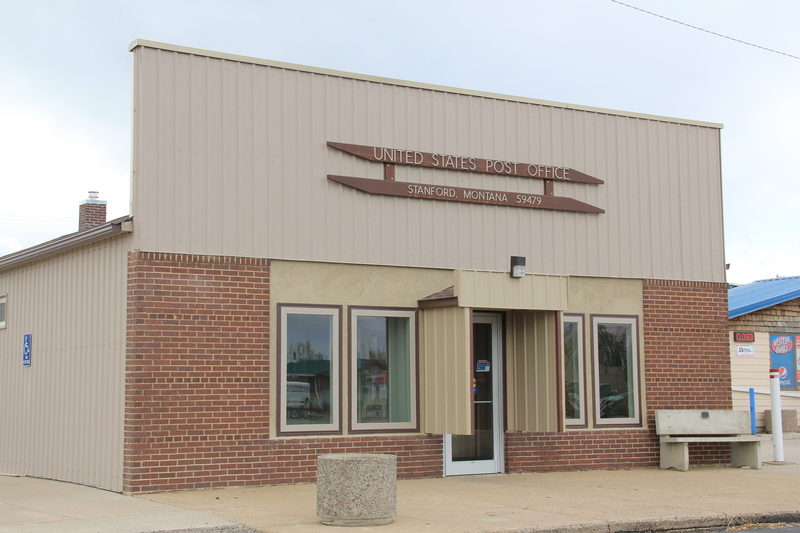 The post office was a rustic-front building that didn’t automatically say “here’s the federal government.” The local county museum–also worth a stop–stood in a typical mid-1960s commerical-type building. Stanford had been relatively stable since reaching its population height in 1960 of 615 residents–when I visited in 1984 it had only dropped by a few families to 595. 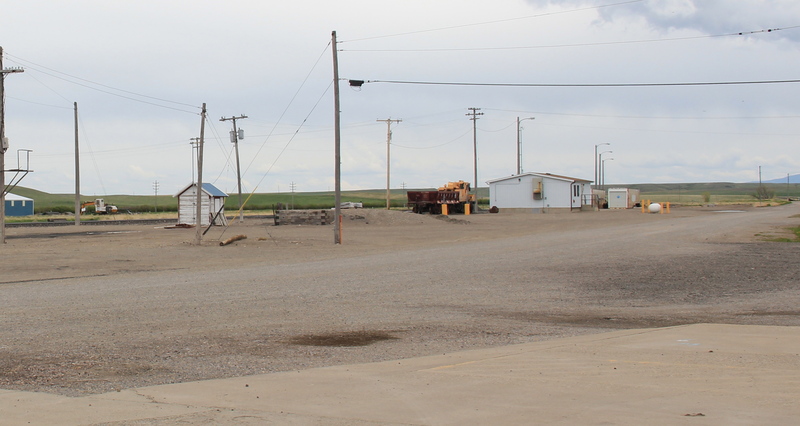 But now the town was boomed, to well over 700 residents, reflected in the new fronts to the town’s businesses and maybe an indication that the sign on the highway has worked. With that growth, however, has come one significant loss to Stanford’s historic fabric–the standardized design of its Great Northern depot. It was there during my last visit c. 1998 but is now an empty spot along the tracks. Despite this loss, Stanford remains an excellent example of the T-plan railroad town of the Great Northern Railway. The top of the “T” comes from the railroad tracks themselves and the lineup of grain elevators along the top of the “T.” In the classic design, the next element is the passenger station, on the other side of the tracks from the elevators, serving as the opening to the actual town. The rest of the plan is intact, especially the long main commercial corridor with businesses and offices on either side terminating in the lot for the county courthouse, in other words local government was at the bottom of the “T” while the railroad, represented by the tracks and depot” stood at the top. The Judith Basin Courthouse is an understated Classical Revival design finished in 1925 and designed by Havre architect Frank Bossuot. Its location, according to John Hudson’s interpretation, said it all about the power of the railroad companies in this era compared to local government. But today, in the 21st century, that earlier arrangement of space has lost much symbolic significance. 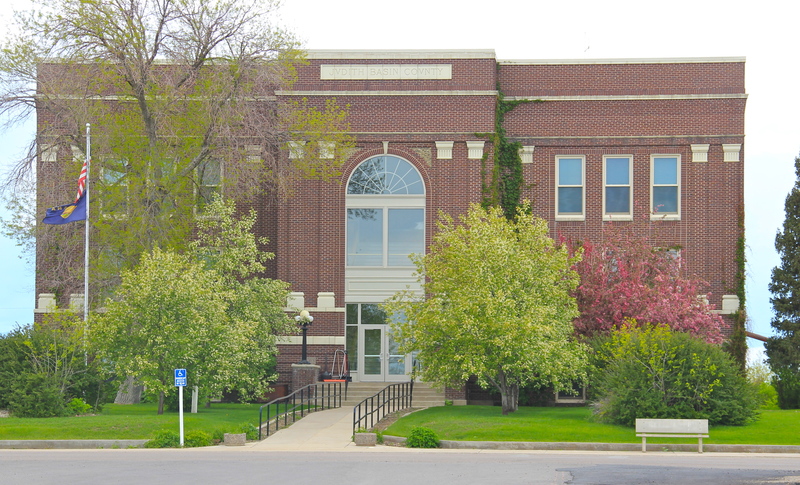 The courthouse, with its inviting landscaping and plantings, is the town gateway. People enter Stanford not by train but by highway and the highway runs south of town, meaning the courthouse and the residents around it are what you first encounter–the community comes first and the railroad comes second. So plains country towns can change–as in Geyser the next stop to the west, where a modern school extension works in partnership with the classic two-story front-tower building from the 1910s-1920s. 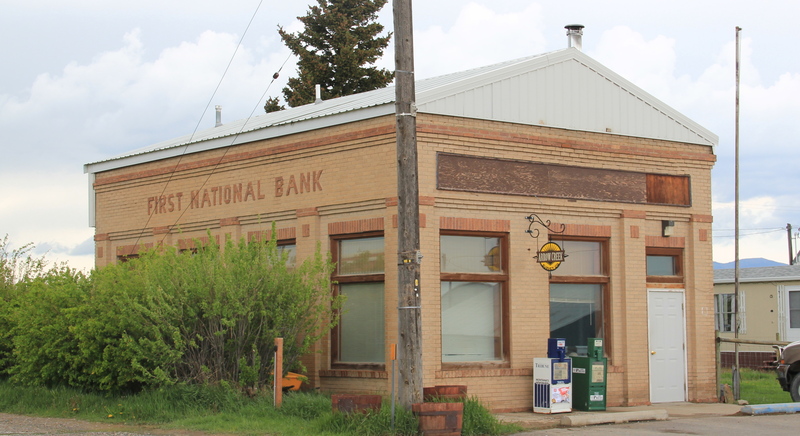 And where, in Geyser, the old state bank has been converted into a surveyor’s office, for growth is coming into western Judith Basin County. 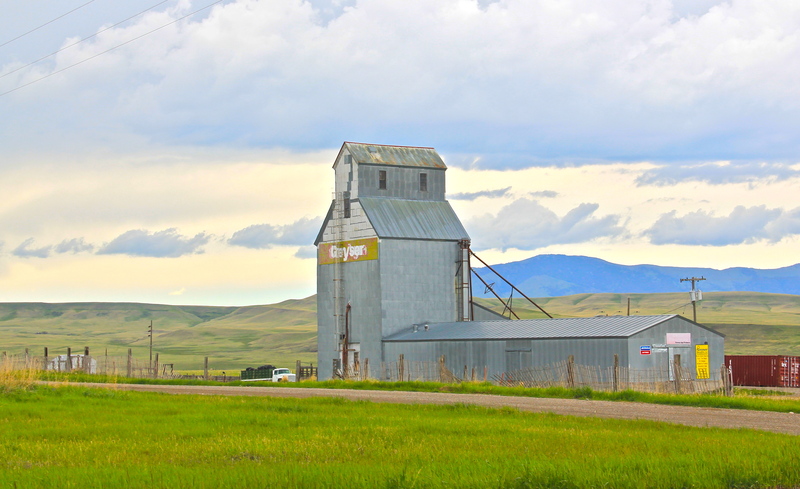 Yet whatever the 21st century promises for these places across central and eastern Montana–most do not have much of a future to contemplate–the past is always near, as the grain elevators from 100 years ago stand as silent sentinels of the hopes and ambitions of the homesteading generation. This entry was posted in Montana historical landscape and tagged Classical Revival, Frank F. Bossuot architect, Geyser Montana, Great Northern Railway, Judith Basin County Montana, Montana bars, Montana depots, Montana museums, Montana schools, Montana signs, Stanford Montana, T-plan towns by carrollvanwest. Bookmark the permalink.